Taiwan reaffirms the strength of its trade relations with the Philippines, in its fourth annual Taiwan Excellence campaign. The 2017 Taiwan Excellence campaign roll out at Fairmont Hotel in Makati this morning was attended by Ambassador Benedicto Yujuico (Philippine Chamber of Commerce and Industry - Chairman), Mr. Gilberto Lauengco (Manila Economic and Cultural Office - Chief Finance Officer), Mr. James Chu (Taipei Economic and Cultural Office Minister), Mr. Tony Lin ((Strategic Marketing Department Deputy Director of the Taiwan External Trade Development Council), including Directors and Board Members from Taiwan. 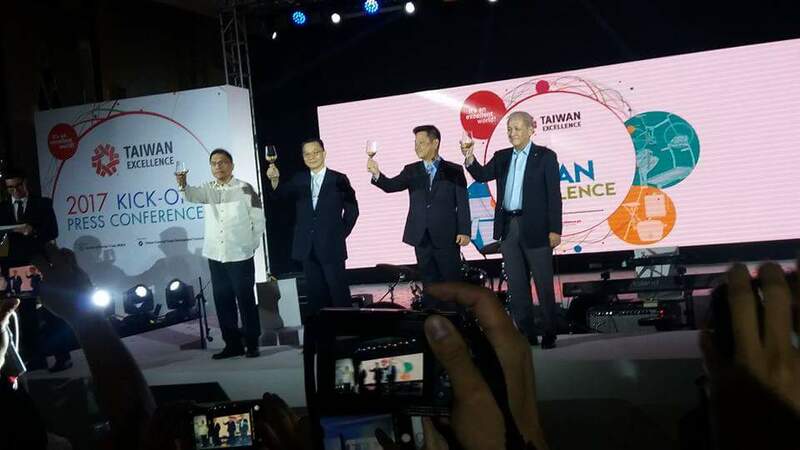 Organized by Bureau of Foreign Trade (BOFT) of Taiwan government and implemented by Taiwan External Trade Development Council (TAITRA), the latest Taiwan Excellence campaign in the Philippines helps bring the best 150 Taiwanese products from 52 brands to the Filipino households. These top quality products have earned Taiwan's symbol of product superiority after scoring high on four criteria: design, quality, marketing plus research and development. Only Taiwan’s top leading brands earn the right to use the Taiwan Excellence seal. TAITRA has expanded their events to further highlight the innovation, reliability, and durability of these brands, which continue to empower consumers toward leading more convenient and enhanced lifestyles. The exhibition promises to bring a new layer of fun for visitors, offering something for everyone. Specific exhibits include: Swift 7 - the slimmest laptop on the globe delivered by Acer; Zenphone 3 Live - the world’s first smartphone with real time beautification technology brought to the world by Asus; Trident 3 - the smallest VR Gaming PC on the planet brought to you by MSI; Core P1 TG Mini ITX Wall-Mount Chassis by Thermaltake; home goods including the Tatung Fusion Cooker and the Vinaera Electronic Wine Aerator; bicycles including Term Cycles and Roxim Technologies Raptor X3 Bicycle Headlight, and sports equipment including Johnson Fitness S3+ Spinner Bike, and Hono YP 2009, the best caddie putter on the planet. Activities slated for the 2017 Taiwan Excellence campaign include (among others): Experiential Zones in SM Megamall (June 2-4), SM Mall of Asia (September 29- October 1) and Glorietta (November 24-26). Taiwan Excellence will also feature in expos such as Systems Integration Expo (August 17-19), Taiwan Expo (September 29 - October 1), and Philconstruct 2017 (November 9-12). Do visit www.taiwanexcellence.ph for the full lineup of this year’s Taiwan Excellence campaign. This sure looks like a very interesting event, especially for those who would like to know more about Taiwanese products. I got my eye on that bike, it is lovely!